1 – She only throws her daughters a birthday party every other year, because at $8000 per party, that’s what makes the most sense. 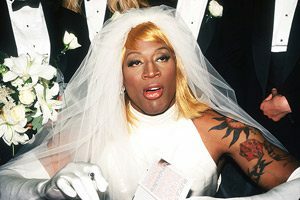 2 – She is CONSTANTLY invited to parties by Rodman (Dennis to those of you not in the know), but she doesn’t go because her friends are NFL players. She didn’t say if she was invited to his wedding though. 3 – She is convinced her next door neighbor hangs out in his bathroom, so he can film her in the backyard. 4 – She was upset because her filler lady (i.e., botox and other stuff that I am not knowledgable about) had to cancel her appointment that day. As did her pedicure person and her fake eyelash person. 5 – Luckily, the filler lady was able to see her later. And rather then leave the party, she just invited the filler lady to come to the party house. Without checking with the hostess to see if it was okay. And then the filler lady starts unpacking her needles and what not in the middle of 7 year olds birthday party. The hostess had to tell them that the girls seeing it wasn’t a good idea and to please go into the bedroom. In the moms defense though, she did offer the hostess the use of the filler lady. A few other things happened, but I haven’t gotten the whole story yet. And I am not sure if I am brave enough too. 🙂 But if I do, I am prepared with the perfect food to accompany the convo. It works for breakfast, snack or dessert so we are set to gossip all day. 🙂 It’s a Berry Chocolate Pastry. There are recipes for this all over Pinterest. They normally involve using refrigerated croissant dough. 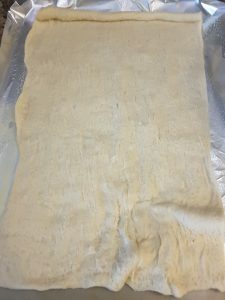 But I didn’t have croissant dough, I had a dough sheet. I think this was better because it was easier. 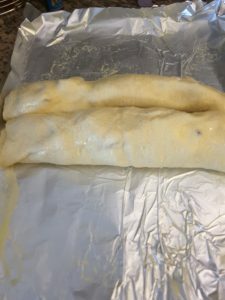 Instead of trying to spoon filling into a bunch of croissants and rolling them, I was able to just spread out the cream cheese, top it with the fillings and roll just once. 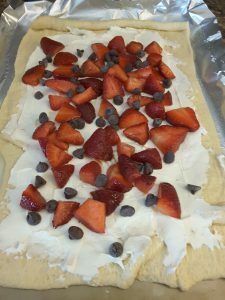 I also rolled in from both sides instead of making just one big jelly roll, because I thought it would make it easier to cut and control the amount of filling again. And it was. 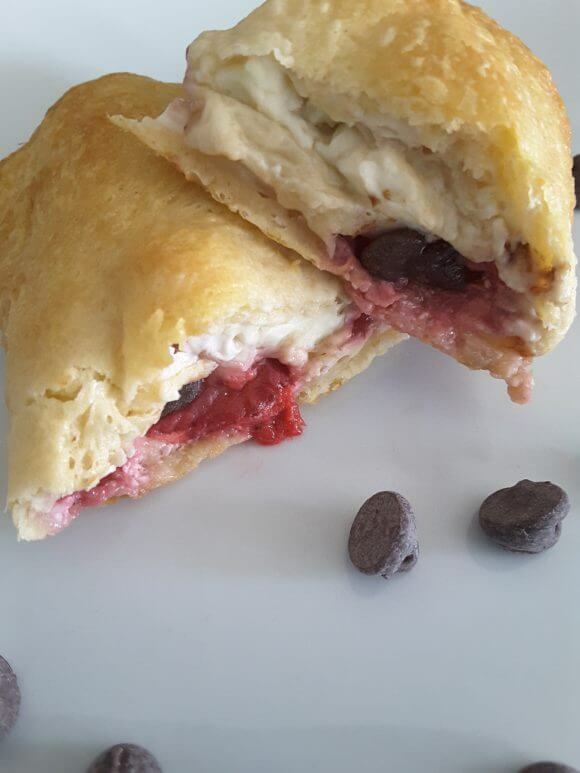 Perfect amount of cream cheese, berries and chocolate chips in every bite. Can’t wait to gossip and eat! In a bowl, mix berries, sugar and vanilla. Set aside. Line a baking sheet with tin foil and coat with spray. 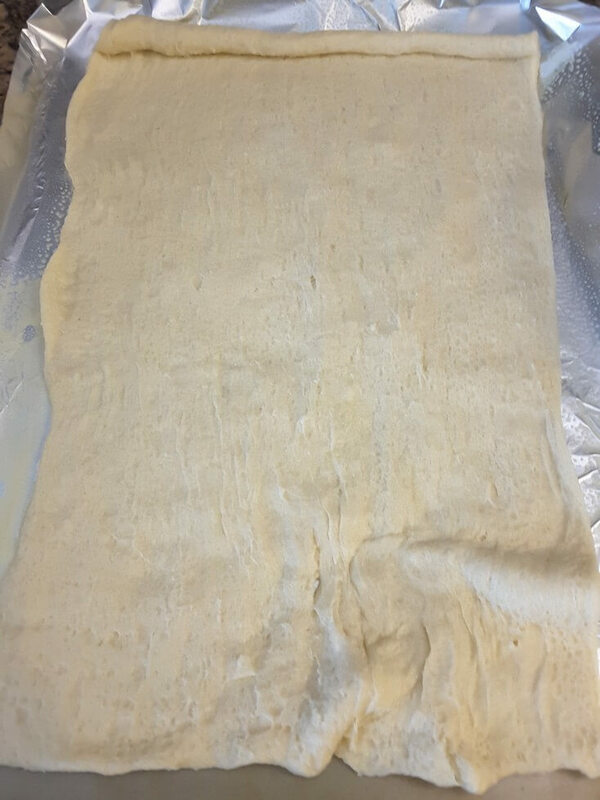 Unroll the dough onto the baking sheet, making sure there are no holes. 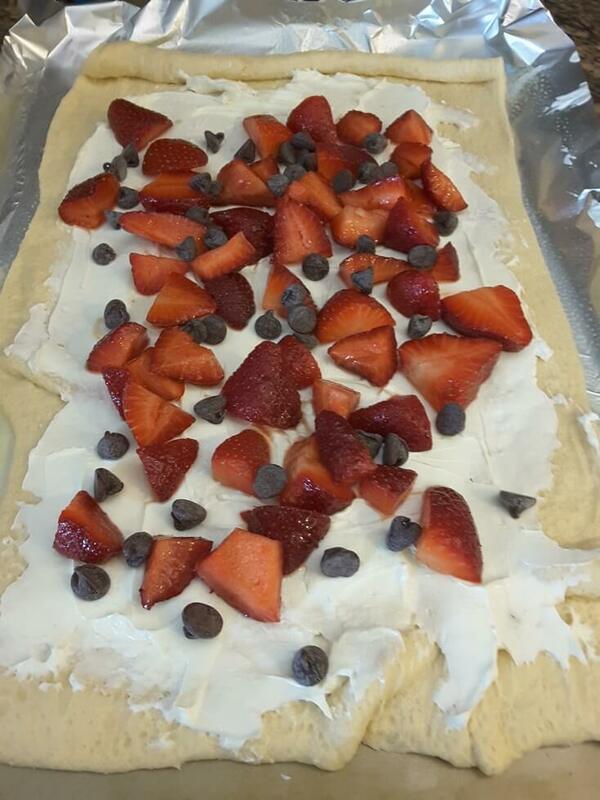 Spread cream cheese onto the dough. Spoon berry mixture on top of the cream cheese. Sprinkle chocolate chips over. 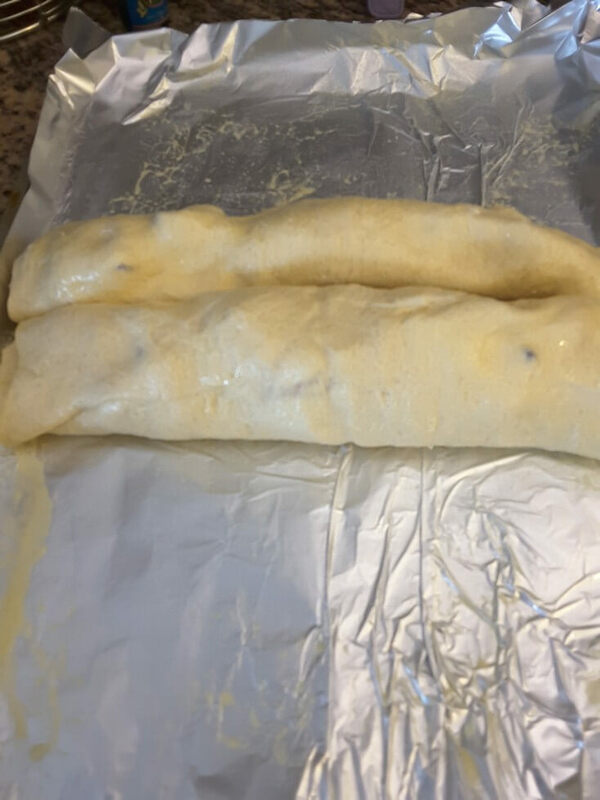 Roll up the dough so that all the cream cheese filling is encased in dough. Bake for 15 minutes until dough is cooked through and golden brown.